Continuing our Brachiosaurus series [part 1, part 2, part 3, part 4, part 5, part 6, part 7], here is another historically important photo scanned from the Glut encyclopaedia: this time, from Supplement 1 (2000), page 157. As with the photo of the mounted skeleton in the museum, this is one of the Field Museum’s own photos — neg. #4027 — but I can’t find a better copy online. It’s got to be out there somewhere — can anyone help? Glut, Donald F. 2000. Dinosaurs: The Encyclopedia: Supplement 1. McFarland & Company, Inc., Jefferson, North Carolina. 442 pages. Apparently the sacrum is the region just below the rock that has the wooden sign “field columbian museum” on it. How the right ilium got ripped off of the thing is hard to say. Also the distal end of the femur is jutting out to the left. This is a very interesting picture. Ribs everywhere. There’s only one partial rib with the present holotype, right? What happened to all those other ribs? Were they really vandalized/stolen as Riggs (1903) seems to imply? 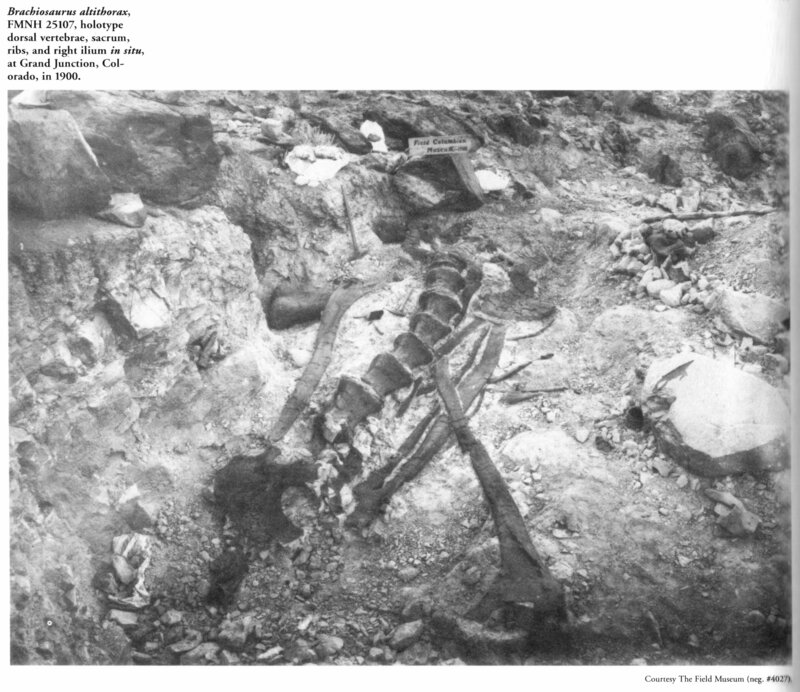 I just re-read Riggs 1903, and couldn’t find any reference to ribs of the Brachiosaurus holotype having been vandalised or stolen. What passage are you referring to? Oops, sorry Mike. My mistake. There was a report from the US department of the Interior that some of the other remains on Riggs hill were vandalized, but apparently the ribs of the holotype were recovered by Riggs. They were just never published as scale figures or photos except the proximal end of one of them. I’ve never seen the other ribs outside of the excavation pics – not in museum setting photos nor figured in any paper. « How big was Brachiosaurus altithorax? I mean, really?